A virtual assistant (VA) is a person who provides support services to other businesses from a remote location. 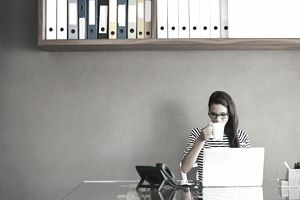 The term originated in the 1990s as the ability to work virtually due to technology improvements, such as high-speed Internet, document sharing, and other advancements, made working remotely a reality. Virtual assistants are especially in demand by entrepreneurs and online businesses that need help but don't want to bring on staff in their location. However, many small and mid-size businesses use virtual support, especially for specific tasks such as social media management. Theoretically, a VA can do anything any other support staff does, except bring the coffee. (Although when home-delivery coffee is created, the VA will be able to do that too!). However, virtual support duties are not limited to clerical work. Many VAs provide marketing, web design and other services. Some virtual assistants specialize in a specific skill set. For example, a marketing or PR virtual assistant only does marketing or PR work. Other virtual assistants do a variety of duties but within a specific industry. For example, a real estate virtual assistant does many tasks, but only for Realtor clients. Most virtual assistants run their own home-based virtual assistant business. This allows them to earn more (usually $25 per hour or more depending on the tasks offered) and have greater control over the duties they perform. However, many small businesses hire virtual assistants in an employment or contract position. These VAs usually earn $10 to $15 per hour depending on the skill set required. Finally, many VAs use freelance sites or microwork sites to find quick, time-limited projects. These don't usually pay well, but they can offer a start to a new VA. The first step in hiring a virtual assistant is to make a list of the tasks you want to outsource. Make a complete list, prioritizing the activities you want to delegate first. For example, if managing email is time-consuming and tedious, put that at the top of your list. Or maybe tech issues are taking too much time, you can outsource website management. A few great advantages to starting a virtual assistant business are that it's fast, affordable, and easy to do. There is a high need for help, and if you already have the skills and equipment to get started, you can find your first client and be on your way quickly. The first step is to determine the type of service you want to offer and two whom. Will you specialize in a specific task such as graphic design or bookkeeping? Will you focus on a niche market, such as online entrepreneurs or Realtors? Once you know what you're offering, you'll want to set up your price for services, which can be per hour or you can sell packages designed to recruit long-term clients. You'll want to check with your city or county regarding a business license, but if you're fully equipped to provide virtual support services, that could be your only start-up expense. Once you're all set up, you can begin finding clients by contacting your network online and off to let them know about your service. Consider setting up a LinkedIn page and/or a website to make it easy for people learn about you. Other sources of virtual assistant work are on telecommuting job and freelance boards.